Spaceport America was the recipient of two architectural awards, both for the Gateway to Space building. The first award was presented at the NAIOP Annual Eagle Awards luncheon in Albuquerque. 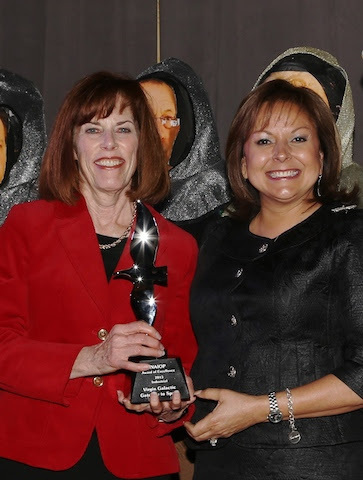 The award for Industrial Building Excellence was presented by Governor Susana Martinez. Christine Anderson accepted the award on behalf of the New Mexico Spaceport Authority and the contractors who contributed so much to the beautiful facility. The second award was from the American Institute of Architects. The award was given to the architectural team of the Gateway to Space building. David Hassard of SMPC Architects in Albuquerque, the architect of record, accepted the award. NMSA conducted an on-site exercise with staff and contractors in December. We expect this to be a monthly occurrence as we ready for an increased operations tempo at the spaceport in 2014. Congratulations to Spaceport America for its Award Winning Architecture! Want to stay abreast of Spaceport news? Sign up to get their newsletter from the footer of the Spaceport America website!